The Vought F-8 Crusader needs no introduction. Its one of the most famous modern jets developed in the Western world. It has proven is worth over the Cuban Crisis and also in the air war over Vietnam. More about the aircraft in Wikipedia. The Academy kit has been around for a while and this kit (kit. No. 12434) is actually a re-box of the same set of spues with different decal sheets. Above all I would like to commend on the superb Cartograph decals that they have included in this version. check out Scalemate that has provided an interesting timeline of this kit. A through review is also available in ModelingMadness. 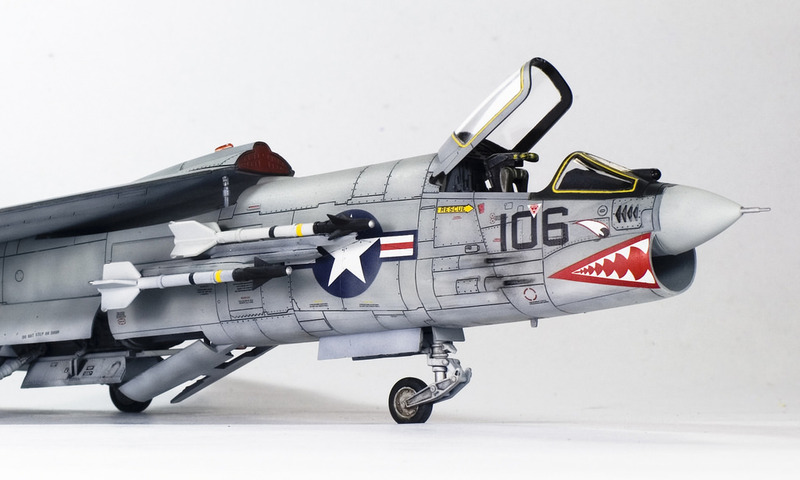 I’ll have to say that this is one of the best 1/72 scale military aircraft model kits that I have made in a long time. From the details to the fit, to the decals, everything went very smoothly. I thought at first that the kit, like other Academy products would give me a fight to the end, but not this one. The kit went a long pretty smoothly at this early stage. the cockpit is small but it has nice raised details for some dry brushing. Fit is exceptionally good. I used Tamiya Extra Thin (TET) cement throughout the whole build. Worth to note that Academy also provided the interior of the wheel bay and the variable-incidence wing in great detail. Again, a great opportunity for some washing and dry brushing. So the first order of the day is actually getting all the interior stuff a coat of Mr. Surfacer 1500 black. This would be the foundation of the XF-2 Flat White that I will be putting on them soon after this photo was taken. Like earlier said, Academy did well in the cockpit area. they provided the cockpit with decals but I prefer to paint them instead rather than the hassle of sanding down the raised details. i did notice that the cockpit side panels are thicker than usual. I knew this later on after the fact and I wished I had shaved off 50% of it. The interior pieces came into its place nicely. Although the fit is great, I added some glue to hold the parts in place. Once the two fuselage halves are put together, you can still see a large portion of the wheel bay and air breaks. Till now, the fit is almost perfect. I did use fillers which is basically the Tamiya’s regular White Putty and of course I had to sand the seam lines but it was still within reasonable efforts. This first step in this phase is to get the Crusader a coat of Mr. Surafacer 1500 Black. But before that, I had to make sure that all surface areas are prepped up. Some panel lines were lost so I re-scribed the ones that were lost to filler and sanding. Clear plastic canopies were masked with Tamiya masking tape and installed. I used TET to secure the front windshield and used Blu-Tack to keep the main canopy in place until the construction is completed. Here is the lower section of the Crusader. You notice that I also have glued the air breaks and landing gear struts. It just makes more sense because they are all in white and painting will be easier. The first part to paint is the area near the exhaust. The basic metal finish is Alclad AL101. After that, I misted light coats of Model Master 1420 Steel non-buffing metalizer in the direction of the rivets and panel lines. I coated everything Alclad ALC600 Aqua Gloss Clear. The second step of the painting process is the white underside. For that I did this in multiple layers of paint. In this case, I am using a relatively thinned version of Tamiya XF-2 Flat White with a 1:5 thinner ratio. Read more about the black basing technique from Doog’s Models. I used Blu-Tack to help create a soft-edge in 1/72 scale. I was hoping it worked but it turned out that the line was too sharp. The Crusader after a thin layer of “FS36440”. I actually have the Mr. Color 325 Gloss Glull Grey. But I was intrigue to try out a mix that was posted at the Fine Scale Modelers forum on using Tamiya paints as a substitute for the Gull Grey. So for the initial layers, I made a home made brew of Tamiya XF-20 Medium Grey, XF-19 Sky Grey, and XF-2 Flat White in a proportional mix. The photo below show the Crusader after a few thin layers of the mix, building up opacity one layer at a time. Final coat is to give the F-8E a thin coat of Mr. Color 325. Mr. Color 325 is quite opaque so if you want to spray it thin, then you need to add a few more drops of thinner. First step to the decaling process is to give a good coat of clear gloss varnish. I used Future floor wax with tap water (ration of 3:2). As the mix dries pretty fast, I did a few more passes to make sure that the surface is as glossy as possible. The Cartograph decal is just wonderful to work with. the black stencils are great, but the multi-colored ones are a bit thick. This is the first time I used Mr Mark Setter and Softer in combination, and they work extremely well with the decals. It ‘melts’ and expands them, making it really easy to work in surfaces with curves and edges. If the decals are still stubborn, then I brushed a coat of Mr. Mark Softer and repeat step #3. The reason is strictly because I was a bit worried that I would not have the time to set the decals in the right position before the Mr. Mark Setter dries up. There aren’t a lot of areas of the kit that needed masking. You get there regular suspects like the clear canopy frames, metallic exhaust area, anti-glare panels, and radome. and they are pretty much simple straight-forward ones with masking tape as the main material. On the other hand, the wheels and tires are a bit of an issue with their circular shape and irregular surface. So I opted to use Blu-Tack (picture below in grey) to cover the wheel (which has been repainted XF-2 Flat WHite) so that I can easily airbrush the tire with Tamiya XF-69 Nato Black. Since my comeback to the hobby four years ago, I have been moving out from enamel based washes to acrylics for the reasoning that most of my builds are enamels or lacquers. And i hate to ruin my model during the last stages of the build just because the paint gave way to the panel wash. But at recent times, I have gotten a curiosity over the Tamiya panel line accent (TPLA). I bought the bottles but was never been able to successfully use it. so this time around, I went on and test it with some modification. BEFORE you do any wash, make sure that the model gets another coat of gloss varnish to seal the decals that you have placed. the varnish needs to be of the ACRYLIC type – such as Future floor polish or Tamiya X-22 Clear Gloss. TPLA is enamel base, so if you tempt to do this on an oil-based clear gloss, it will immediately eat into the coating – this ruining your model. Originally, the TPLA is a bit too thick for me and it doesn’t flow that well. To get as much capillary effect as possible, I decided to dilute it with white spirit, Tamiya enamel thinner, Zippo Ligther Fluid, or turpentine. I like to use a ratio of 1:3 with the thinner. Next step is to apply the wash. Now, for this I don’t use the build-in brush that is included with the bottle because it has little added value: its made of synthetic hair and most of the time its curls. anyway, the brush is just too wide. As an excellent substitute, I used a high-quality ’00’ pointed brush with natural-bristle. You want to add as much wash INTO the grooves, not outside it and these kind of brushes can give you the control that you need just to do that. Since the TPLA has been diluted it is easier for me to apply it. Just dab the tip of your brush at an area on the panel lines, and the capillary action will push the wash through the grooves. When you rub the excess, it is recommended that you move the cotton bud along the fuselage, following the path of the air flow (i.e. : rubbing from front to back motion or vice versa). You can always use a cotton felt to clean up more of the excess wash.
Everything seems to look great except that the decals look pretty new compared to the weathered paint of the Crusader. So this next step is to tone down the F-8E and the decals so that look similar in wear. Depending on how much wear and tear you want to show on your model, there are many ways to make the decals look tatty and used. But for this project, my goal is to make the decals looks a little bit faded, so it can blend in with the overall look of the Crusader. For that, I used a very diluted mix of the base paint Mr. Color 325 “FS36440” with Tamiya XF-2 Flat White which I add a copious amount of thinner (ration 1:8). Working from one panel to the other, I lightly sprayed the mix. I kept the airflow pressure low, and set the airbrush to spray less air and paint – keeping the spray local and thin. with this step up, you can have more control of how much ‘fade’ the decals want to appear. I have used a couple of products in the past, notably my favourite is Testor Dullcote. Unfortunately, that’s a luxury where I live in Indonesia as no one is importing that brand anymore. So I have moved on and have used Mr. Color 30 Flate base with some great flat finishes. Gunze is sold everywhere so plenty of sellers and plenty of supplies. They are lacquer base and gives a very strong odor. Always spray in a VERY ventilated area with fans blowing the fumes away from you. My mix is usually a ratio of 1:5 with the thinner and usually spray a few thin passes until the model becomes dull and matt. Pitot and Oleos. I painted with a 00 pointed brush the pitot tube and oleos of the landing gears with Mr. Hobby 8 Silver and a ’00’ pointed brush. AIM-9D Sidewinders. As posted in Wikipedia, Crusaders on USS Oriskany used the AIM-9D version of the missile to down its victim. Unfortunately, I read this article too late and it goes to show that doing your homework, researching what you are about to build is critical if you want your model to look right. The ones that Academy has supplies are actually more towards AIM-9H models. With that said, – and knowing for a fact that my Sidewinders have all been painted – I continue to add them on the railing as a “what-if” armed Crusader. The Sidewinders got a base coat of XF-2 Flat White and XF-1 Flat Black for the front end. The yellow and black rings are decals supplied by the box. The photo above shows how the Sidewinders are attached onto their railing. I drilled a small hole on the rear end of the missiles (hidden under the fins) and inserted a 0.7mm copper wire (from a land base telephone cable). and I glued them up using CA glue.